Here is an interesting point-counterpoint argument about women’s ordination. The debate has been raging for 40 years, since 1975 (or actually since at least 1881). 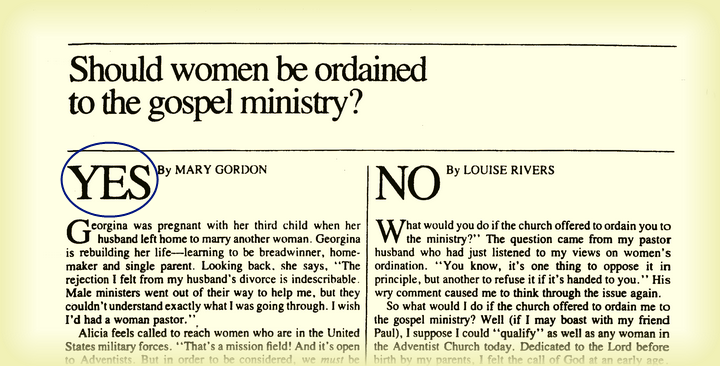 This article was published in the Adventist Review 30 years ago in 1985: “Should Women Be Ordained to the Gospel Ministry?” Read it at http://drc.WhiteEstate.org/files/63.pdf . We think the “Yes” argument on the left side is more scriptural, well-reasoned, and compelling. How about you? Pro-WO, or Anti-WO? You decide.